COPENHAGEN, Denmark, July 14, 2018 (ENS) – An iceberg four miles (six kilometers) wide has broken off a glacier on Greenland’s east coast. It happened in late June while American scientists were there and were able to record the event on video. A 30 minute video of the glacial activity, known as calving, was taken on June 22 by Denise Holland of New York University’s Environmental Fluid Dynamics Laboratory. 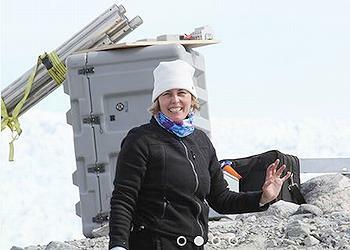 She and husband NYU professor David Holland, an atmospheric and ocean science expert, had been camped by the Helheim Glacier for weeks to collect data on sea level changes due to the warming climate. The iceberg that resulted from the calving of the Helheim Glacier would stretch from lower Manhattan up to Midtown in New York City. Glacial calving is a direct result of global warming, the scientists say. Helheim Glacier is one of Greenland’s largest outlet glaciers and is named after the world of the dead in Norse mythology. 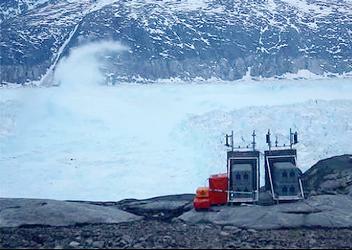 It feeds the waters of the Helheim Fjord, where other glaciers are calving and discharging at rapid rates. “It sounded like rockets going off,” he said. 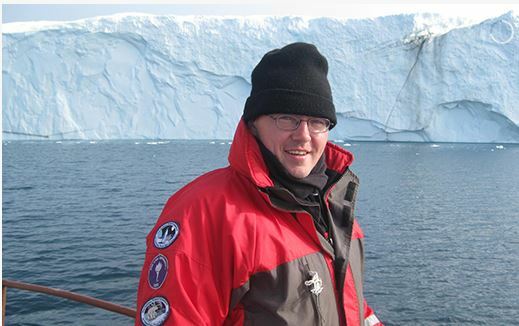 “Knowing how and in what ways icebergs calve is important for simulations because they ultimately determine global sea-level rise,” said Denise Holland. On the other side of the giant icy island, in northwestern Greenland, another large iceberg appeared to be grounded on the sea floor near the village of Innaarsuit, with a population of 169. Innaarsuit is situated about 1,000 kilometers (620 miles) north of Greenland’s capital and largest city, Nuuk. A picture taken on July 13 shows the iceberg behind houses and buildings after it hit bottom outside Innarsuit. If a strong wind hits, it could move the stranded iceberg harmlessly out into Baffin Bay. Or, in a worst case scenario, rain could further destabilize the iceberg, melting a piece of it into the ocean and creating a wave that could wash away part of the village. “We are very concerned and are afraid,” Karl Petersen, chair of the local council in Innaarsuit, told the Canadian Broadcasting Corporation.